JAN 10 Black & Pink: Film screening of Cruel & Unusual: Transgender Women in Prison and discussion on Black & Pink’s stance on prison abolition and what that means in our communities. Activist Center- 4246 Whitman Ave at 7pm. JAN 24 Colectivo Zapatista & Palestinian Youth Movement San Diego: We invite community to participate in a run/walk event to highlight the injustices happening at imperialist, colonial borders that function to steal our indigenous lands and divide our communities. Larsen Field, 4100 Camino de la Plaza, San Ysidro, CA 92173 at 9:30am. JAN 30 Association of Chicana Activists: Come and join A.Ch.A. in a dialogue about the different challenges and struggles that womyn face when immigrating to the U.S. We will be screening a film and will be having different activities throughout the event. Location and Time are TBD. Please see the Enero Zapatista site for more details. 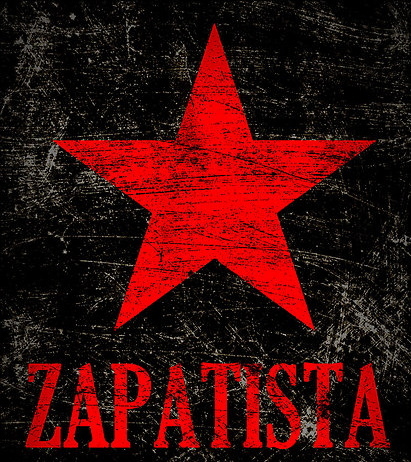 JAN 31 Enero Zapatista 2015 Closing: This is the last event of Enero Zapatista 2015. There will be Art, Food, Vendors, and Performances and more! The lineup will be announced soon! Come join us for this celebration. Centro Cultural de la Raza 2004 Park Blvd 92101 from 6:00p-11:00p. MEChA at Lincoln HS: Lincoln MEChA is not your typical high school MEChA. Instead of being just a “club”, it is a student organization that stays true to its historical roots of activism and organizing. El Movimiento Estudiantil Chican@ de Aztlan de Lincoln High School focuses on education and liberation of our communities! 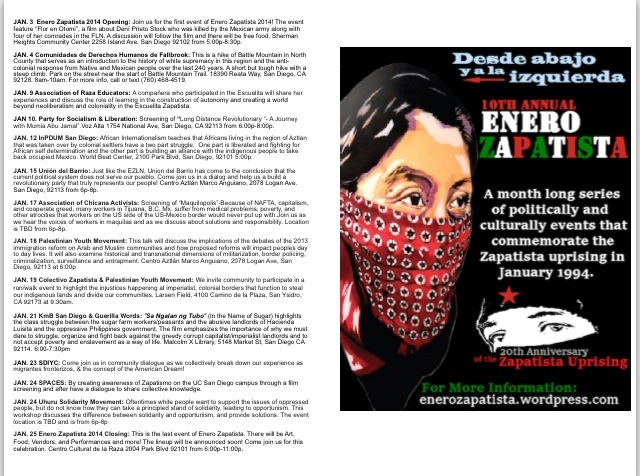 Join us for the first event of Enero Zapatista 2014! The event feature “Flor en Otomi”, a film about Dení Prieto Stock who was killed by the Mexican army along with four of her comrades in the FLN. A discussion will follow the film and there will be free food. Sherman Heights Community Center 2258 Island Ave. San Diego 92102 from 5:00p-8:30p. This is a hike of Battle Mountain in North County that serves as an introduction to the history of white supremacy in this region and the anticolonial response from Native and Mexican people over the last 240 years. A short but tough hike with a steep climb. Park on the street near the start of Battle Mountain Trail. 18390 Reata Way, San Diego, CA 92128. 8am-10am. For more info, call or text (760) 468-4519. A compañera who participated in the Escuelita will share her experiences and discuss the role of learning in the construction of autonomy and creating a world beyond neoliberalism and coloniality in the Escuelita Zapatista. Voz Alta 1754 National Ave, San Diego, CA 92113 from 6:00p-8:00p. African Internationalism teaches that Africans living in the region of Aztlan that was taken over by colonial settlers have a two part struggle. One part is liberated and fighting for African self-determination and the other part is building an alliance with the indigenous people to take back occupied Mexico. 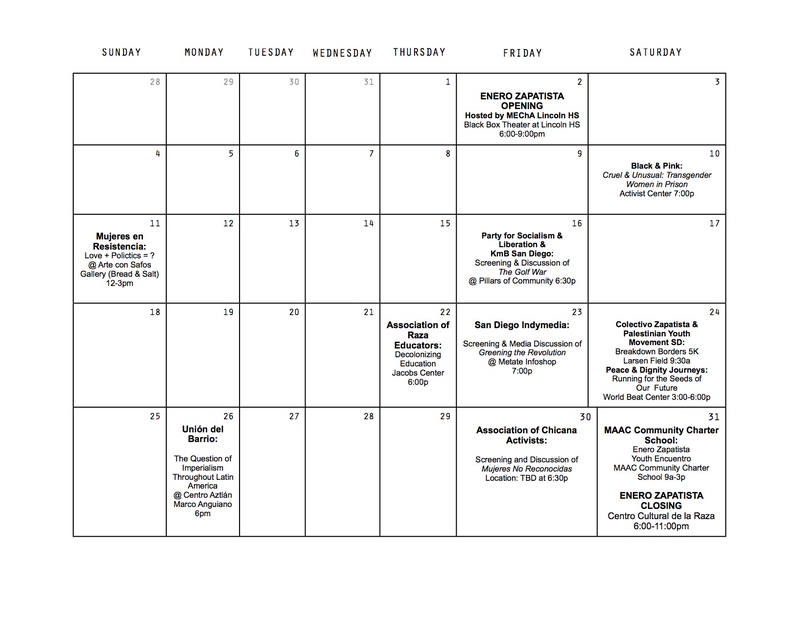 World Beat Center, 2100 Park Blvd, San Diego, 92101 5:00p. Just like the EZLN, Union del Barrio has come to the conclusion that the current political system does not serve our pueblo. Come join us in a dialog and help us a build a revolutionary party that truly represents our people! Centro Aztlán Marco Anguiano, 2078 Logan Ave. San Diego, 92113 from 6p-8p. Because of NAFTA, capitalism, and cooperate greed, many workers in Tijuana, B.C, Mx. suffer from medical problems, poverty, and other atrocities that workers on the US side of the US-Mexico border would never put up with. Join us as we hear the voices of workers in maquilas and as we discuss about solutions and responsibility. Location is in Cholula Community Center in the San Diego State University campus, next to Remington Road next to the Cross Cultural Center and across the street from the Tony Gwynn Stadium from 6p-8p. We invite community to participate in a run/walk event to highlight the injustices happening at imperialist, colonial borders that function to steal our indigenous lands and divide our communities. Larsen Field, 4100 Camino de la Plaza, San Ysidro, CA 92173 at 9:30am. Come join us in community dialogue as we collectively break down our experience as migrantes fronterizos, & the concept of the American Dream! This is the last event of Enero Zapatista. There will be Art, Food, Vendors, Performances and more! The lineup will be announced soon! Come join us for this celebration. Centro Cultural de la Raza 2004 Park Blvd 92101 from 6:00p-11:00p. We encourage you to submit an art piece that is ZAPATISTA INSPIRED for the closing event of Enero Zapatista 2014! The artwork will be installed in the gallery at the Centro Cultural de la Raza. Each artist is required to fill out this exhibition form in order to participate. The form needs to be submitted by December 15, 2013. The artwork needs to be dropped off between December 16 – December 19 from 5-7p at the Centro Cultural de la Raza. If these dates and times do not work for you, please contact the committee to schedule a time to drop off your artwork. Please have the artwork ready to hang! Se les invita a mostrar una obra de arte inspirada por el Zapatismo para el evento de clausura de Enero Zapatista 2014. Las obras se instalarán en la galería del Centro Cultural de la Raza. Se requiere que cada artista llene este formulario de exposiciones para participar. El formulario debe ser entregado para el 15 de diciembre 2013. La obra de arte debe ser entregada entre el 16 y 19 de diciembre en el Centro Cultural de la Raza, de 5pm-7pm. Si estas fechas y horario no le funcionan, favor de comunicarse con el comite de enero zapatista para coordinar. Favor de tener a la obra lista para colgar. Pictures provided by Colectivo Zapatista. Reflections are by organizers of the 2012 Enero Zapatista. What is the connection between Hip Hop and White Supremacy? Or between Congo and Ciudad Juarez? Computer music and Palestine? It was amazing to see how much and how many different struggles can connect to each other across time and space. And to see how many people connected to each other in all events. Enero Zapatista 2012 opened with the Red Warriors drummers and their impressive chants: the depth of their voices prepared us for a month of deep reflection and debate. Enero 2012 closed with Mujeres en Resistencia and their powerful choreography: the clanking of their knives resonated with the sharpness of Zapatista radical politics, throwing us straight into the future. My favorite part of Enero Zapatista was seeing our compas Olmeca and Cihuatl-Ce perform at the Centro during the Closing Celebration. Although it has been a few years since the last time they performed together at Enero Zapatista, they conveyed a message that the struggle never stopped and that we have to continue adapting so that a new world can be built in the shell of the old, as the Wobblies would say. Olmeca commented that he is always energized by Enero Zapatista, because there are not many events in LA that are cultural celebrations of organizing from below and to the left. It made me proud that, in a city that sometimes feels like a little sister to the metropolis up north, we are able to come together every year, strengthen our connections and carry out events that have a true impact. Sabado 28 de Enero del 2012, una tarde en la cual familias puedieran estar tomando su fin de semana descansando, y cenando junt@s, muchas personas acudieron al Centro Cultural de la Raza en el parke Balboa de San Diego para participar en algo que no sale de lo usual del año nuevo; una celebracion. Una celebracion con un mensaje diferente; el mensaje de los Zapatistas. Durante todo el mes varias organizaciones y personas individuales se juntaron para organizar eventos en homenaje al levantamiento Zapatista del 1ro de Enero de 1994, y el cierre de Enero Zapatista fue la culminacion. El ambiente era calido, la musica energetica, y los tacos bien chingones. La musica rebotaba de las paredes y penetraba los oidos de l@s estudiantes, padres, hij@s, herman@s, prim@s, sobrin@s, y asta un@ que otro abuelit@ y bebit@. Desde las 6 asta las 11, el centro estaba retacado asta las orillas de gente, todas las personas acudieron a este evento que fue organizado por y para la comunidad, no por y para la satisfacion de solo una(s) (cuantas) persona(s). El proposito era simple, toma tu propio destino, organizate y a tu comunidad, no dependas de l@s politicos que hacen campañas y prometen cosas que nunca cumple solo para ser elejid@s, toma tu futuro en tus manos y crea tu propio destino, y no olvides a tu comunidad. The room was warm and full of life. Saturday of January 28, 2012, an evening during which families could be eating at home, watching tv, or resting at home decided to spend their night doing something typical of the new year, celebrating. Celebrating a different message; the message of the Zapatistas. 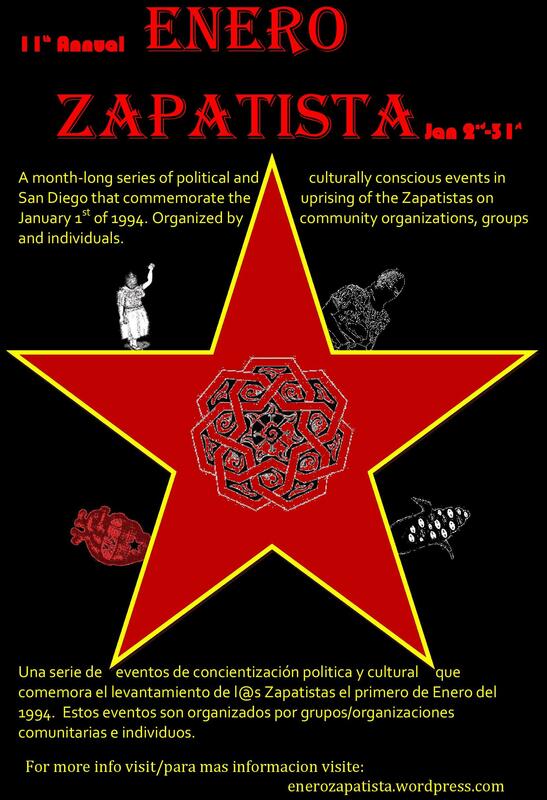 This closing event for Enero Zapatista was a culmination of a monthlong series of events organized by different organizations and individuals to commemorate the uprising of the EZLN in January 1, 1994. This celebration at the Centro Cultural de la Raza in Balboa Park was full from 6pm to 11pm, the time the event ended. Through the night, performers and speakers shared a message of cultural identity, and resistance to discrimination, and to take your future into your own hands, to make your own decisions regardless of what politicians who run platforms in order to get votes promise you, to later “forget”. Never forget where you came from. This was my first time organizing and taking part of an event. Thanks who made this experience the best. It was heart warming to see all of our companier@s as well as new people. Especially the last event where it was jam pack of our brothers and sisters of different nationality. VIVA LOS COMPANIIER@S EN LUCHA!